A carnival experience that your group will talk about for years! The Dynamix team will set up a free-flowing Carnival FAIR with some of the most unique carnival booths ever seen. Participate in a great selection of individual and team activities, as you collect tickets to win some awesome prizes! Two teams of players must race to navigate 3 balls through the labyrinth and drop it in a bucket, without dropping or touching the balls – otherwise you start over! 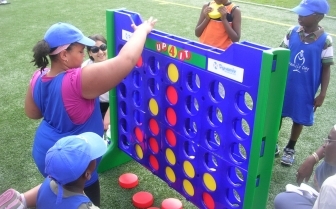 Two players must take turns dropping their coloured connect 4 pieces into the giant game board in an attempt to get four in a row. Players will need to work together in 2 teams and race to get from the start line to the finish line wearing a pair of team skis. Two players face off in a game of 1-on-1 hockey in which players must navigate the puck through holes in the walls of 4 sections in the boxed arena in order to score on the opponent’s net. The first player to score wins the game!